“Is there something on,” asked Catherine as we were overtaken by another gaggle of runners who were filling up the narrow tow path near Kew Bridge. We were barely able to walk a few metres before another set of lycra clad people zoomed past going goodness knows where. “I don’t know,” I replied, helpfully, as a family of cyclists appeared surreptitiously behind us to break up the flow. It all became clear a little further on thanks to a large yellow plastic sign, attached to a tree trunk. “CHECKPOINT AHEAD” it screamed in bold black lettering. Thankfully though, this was not passport control and no valid form of ID was required to walk on the tow path alongside Kew Gardens. No, it was in fact the small logo in the top left of the sign that explained all. “Royal Parks Foundation Ultra,” it proclaimed. “A 50K run for charity” it further explained. As someone whose main running experience used to be the occasional jog round our local park, the idea of doing 50 kilometres – or 31.6miles in old money – sent shivers down my spine. I never did tot up the distance I’d do round the park – and getting to and from it – but I vaguely estimated it would be about 3-4km. I reckoned I could easily manage a 5km run; probably even a 10km one if I did a little extra training. But 50km? No chance. Besides, I’d given up running and switched to swimming instead. Rumours that this decision was related to me not having the physique for the black and orange Lycra running tights, are completely unfounded. We passed by the checkpoint, our arrival not particularly registering much interest in the hordes of volunteers manning it. A woman from one charity stood, cheering on the runners, her shrieks of “Wahoo! Way to go guys!” inadvertently waking up the ten month old baby being carried on Catherine’s back; the bit of breadstick Sam had been diligently clutching whilst dozing away, tumbling to the ground, only to be ground to dust by yet another runner. Sam wasn’t particularly keen to be awoken in such abrupt way and soon began to make the entire area know this fact, resulting in runners being both whooped and hollered one minute, and screeched and cried at within a matter of metres. Baby duly calmed, and partly pacified by the provision of a replacement breadstick, we headed off once more. We were now walking alongside the Royal Botanic Gardens, Kew, a fence and a water filled ditch separating the path from the gardens. 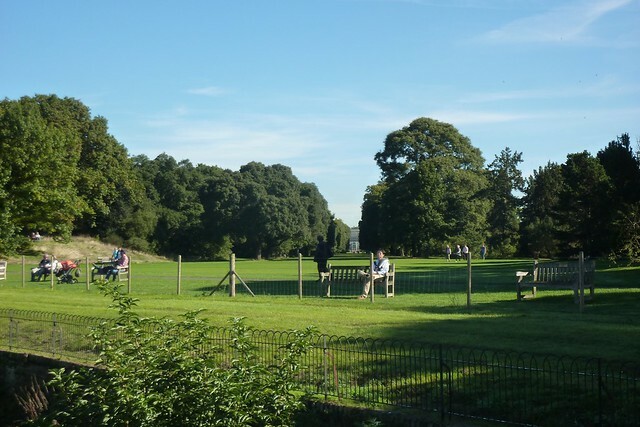 Along the fence, Kew Gardens had installed a long row of benches enabling people to sit down and admire the view, although not of the gardens themselves. Anyone sitting on the bench actually ended up with their back to the place they’d paid sixteen pounds to get inside. Instead their benches looked out over the Thames and to Syon House in the distance. The house – the London residence of the Duke of Northumberland – sits in its own area of parkland, with its landscaping created by Capability Brown, perhaps the most famous of all landscape gardeners in the country. 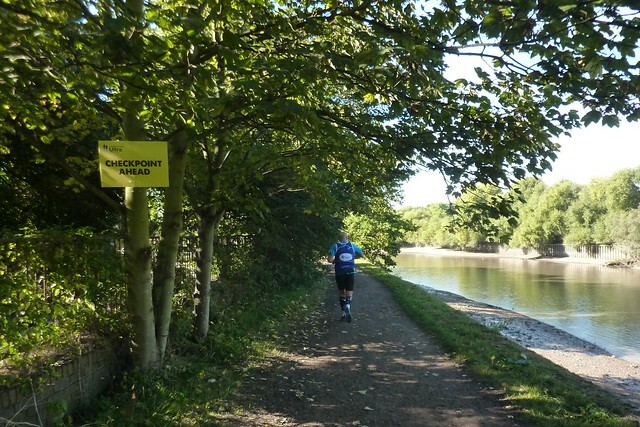 Between them, Syon Park and Kew Gardens cover 200 hectares of land, resulting in the Thames Path heading through a glorious and uncharacteristically green section. But it’s not alone. 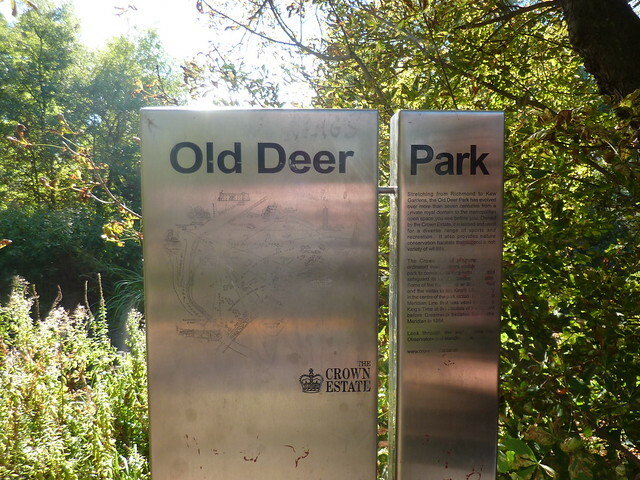 Next to the Kew Gardens on the south bank is the giant sprawl of Old Deer Park, 147 hectares of open space owned by the Crown Estate. Originally known rather grandly as “The New Park of Richmond”, it was opened as a hunting park by King James I in the early 17th century. Its current name comes from the fact that the deer moved out many years ago, which disappointingly meaning there’s no chance of Queen Liz leaping on a horse and chasing a stag into the undergrowth. In fact Old Deer Park’s time as a hunting park was rather short. By 1637 Charles I had decided to open up Richmond Park on the other side of town. In place of the deer now are middle aged people in Pringle sweaters of dubious designs. Ah yes. Golfers. The Royal Mid-Surrey Golf Club has a majority of the land, and has done since it was established in 1892. One of its original members was one Prince George, Duke of Cambridge, who just happened to also be the club’s first president. One can only imagine the internal debates and strife around making that decision. As well as the golf course, Old Deer Park also hosts football and rugby pitches, the council swimming pool (including a 33m long outdoor pool), Kew Observatory, and a meridian. The Prime Meridian has long resided at Greenwich, but prior to that it ran through the Observatory building here. Established by King George III (he of the Madness of King George), the King’s official time was measured from here, and the Observatory also had a role in testing such things as watches, thermometers and barometers. Opened in 1769, the Observatory operated in several related guises until 1980 when the Met Office moved out. Despite being in the middle of the golf course, the building spent several years as offices for the holding company of Autoglass before they departed in 2011. There are now plans to turn the listed building to residential purposes. And, not surprisingly, we are not talking social housing here. At Richmond Lock the river changes. On the London side of the lock, the water level is firmly at the whim of the tide. And on the other side, it isn’t. But whilst the Richmond to Teddington section is still tidal, the lock’s sluice gates are used to maintain a consistent water level. With a consistent water level, the Thames becomes more attractive for leisure activities, and from now the riverside would be lined with pleasure craft of all sizes, from tiny rowing boats through to massive leisure cruisers which looked like they’d be more suitable for transatlantic voyages than pootling up the river for an afternoon. Of course, boats can get between the two sides of the river, although they’ll need to pay a charge. Those wanting to jump between the two need only wave a fiver to the lock-keeper, whose giant dot matrix sign outside the lock flashed the message that cash and credit cards were happily accepted, although there were few takers. Those wanting to avoid the charge need only wait for the mere two hours a day at high tide when the sluice gates are opened and all traffic can cross. After the traumas of the mud related wheel problems on our last walk, we’d left the buggy at home, preferring to have Sam in a back carrier instead. And after ninety minutes he was bouncing up and down, and wriggling around in it in frustration. It was getting close to lunch time and he was letting everyone in the area know of his desire to stop off and eat something. The cries could be heard for miles around; small dogs winced as they walked past and cats ran off in horror. Thank goodness the facilities of Richmond were almost upon us, and we stumbled into the first riverside pub we came across; Sam immediately rejoicing at the sight of the beer pumps and ample servery. It also turned out the White Cross was probably the only prominent “child friendly” pub on the River Thames not to have high chairs, resulting in a number of patrons wobbling small children on their knees whilst attempting to dine. In fact the pub seemed better equipped for dogs, people wearing wellington boots and those that had brought their own rowing oars in with them, than it did for children. There was discussion of finding somewhere else that was just slightly better well equipped, but Sam had the menu firmly in his sights. And his mouth too. His decision was final. Richmond was heaving. Not since we’d walked near the London Eye had the tow path been so crowded. Half of south London was out taking in the sun and sights, whilst admiring the vocal stylings of a busker who was torturing seventies rock tunes on his acoustic guitar. Outside the Slug and Lettuce pub, a large queue of people had formed, seeking a table for Sunday lunch, and the same story was told at several other establishments that lined the river. The ice creams were doing a roaring trade, and about the only people who seemed to be not particularly busy were the yellow clad volunteers manning the Royal Parks Ultra checkpoint. Only a few stragglers on the 50K run remained, to be spotted moving through the crowds at a less than hurried pace. 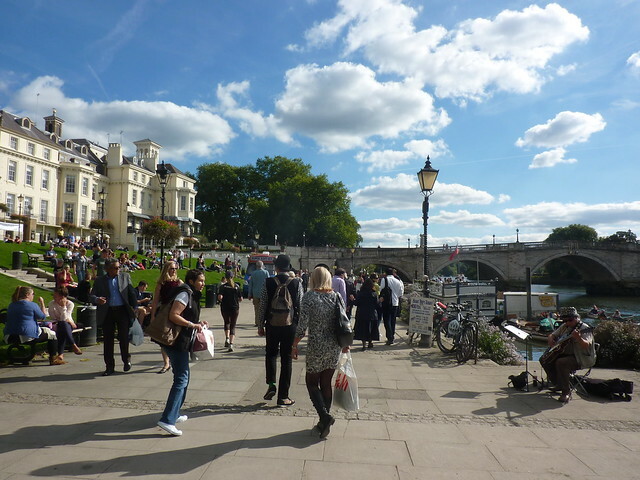 Thanks to a quirk of geography and, indeed, the way the river bends and weaves as it makes its way south, Richmond was where the South Bank of the river was now north of the north bank, which was on the south. Despite the bustling crowds, it was a pleasurable atmosphere as we headed through the parkland of Buccleuch Gardens. 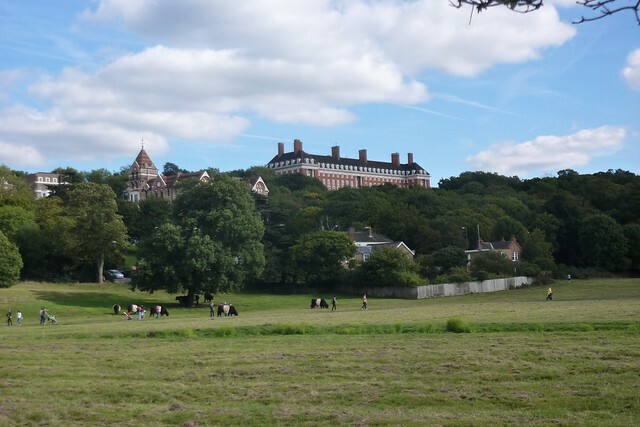 Up on Richmond Hill above the park stood the grand building of the former Star and Garter Home. During the Victorian era, it had been built as a grand hotel, putting up Charles Dickens and the exiled King of France, Louis Philippe I. Part of the hotel’s success came from its more rural setting, yet also being close to London. The arrival of the motorcar, and the fashion for holidaying in further climbs put pay to the hotel and during the First World War it was converted to a home for paralysed and disabled servicemen. The residents finally moved out in the spring of 2013, relocating to a new purpose built home in nearby Surbiton. The building was sold for a whopping $50m for conversion to – yes, you guessed it – luxury residential apartments. The further I headed down the river, the more such developments began to really annoy me. Where was the housing for mere normal people? A few weeks earlier I’d heard Boris Johnson, the Mayor of London on the local television news describing how flats costing £350,000 in one complex were “extremely affordable”. Extremely affordable for who? Well that he didn’t explain. Somehow I doubted the new flats at the Star and Garter would be definable as “affordable”, extremely or otherwise. Staring at the river, the sun glistening on its water, lightened my mood and a little outside Richmond we spotted the first ferry crossing on the Thames since Woolwich. 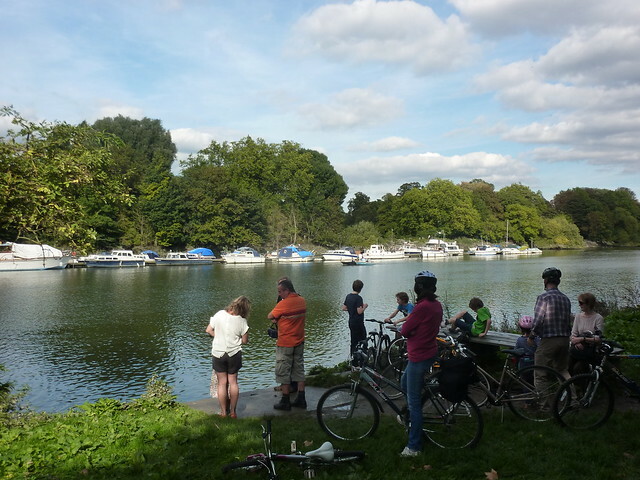 Whilst the Woolwich Free Ferry – just downstream from the barrier – allows for lorries, cars and up to 500 passengers, Hammerton’s Ferry is a bit more low key, the small boat carrying around twenty passengers on its short journey between the Ham and Twickenham banks. And all for a mere pound for an adult, with a further 50p for your bike. “Someone’s having a good time!” noted the occupant of another of the 50K run’s checkpoints as Sam burbled happily to himself. “Na-na na na na!” was the cogent reply from our young one. It didn’t matter how many times I told him he needed to work harder at providing a coherent response to people. He just didn’t seem to take it in. He wasn’t that impressed by the obelisk we passed at the side of the path either, showing some hint of disapproval as we stopped to look at it. Funnily enough, the obelisk was exactly what it said on the tin. These days responsibility for managing the River Thames is split between two bodies: the Environment Agency and the Port of London Authority, but it wasn’t always so. 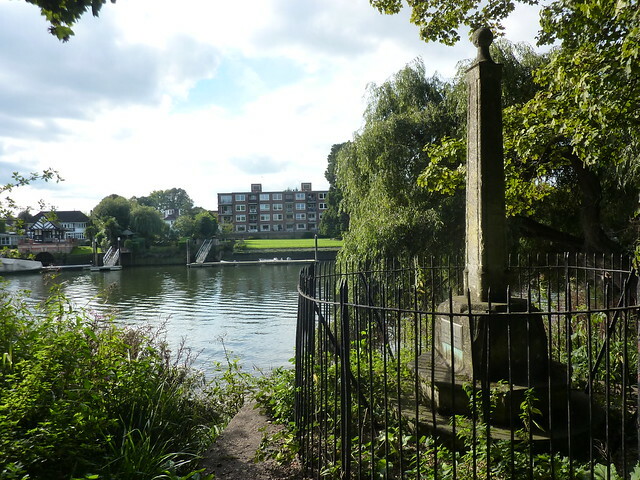 The Thames Conservancy was first formed in 1857, taking over the management of the section of the river running from Staines to the sea, from the City of London who had been responsible for it since 1197. In 1866 its role was extended to look after the whole of the river, but – as things go – that changed again when, in 1909, the Port of London Authority took over the section from Teddington to the Thames Estuary – basically the tidal Thames. Naturally when you’ve got two organisations responsible for different things, you need some sort of boundary stone and the obelisk we were looking at now was erected to mark that boundary. The Thames Conservancy disappeared in 1974, becoming part of the Thames Water Authority. After a brief stint under the control of the National Rivers Authority, the Thames eventually ended up in the hands of the Environment Agency in 1996, who remain charged with managing the non-tidal river to this day. Despite that, no one seemed to have bothered with rebranding the obelisk. Or perhaps there simply wasn’t much point to it in the first place. Now you might think that the obelisk is, in fact, a redundant and rather pointless hangover from a bygone era; a relic that no one cares about. But for those on the river the marker for the old Thames Conservancy limit is important. It marks the point on the river that you need a licence to use your boat. 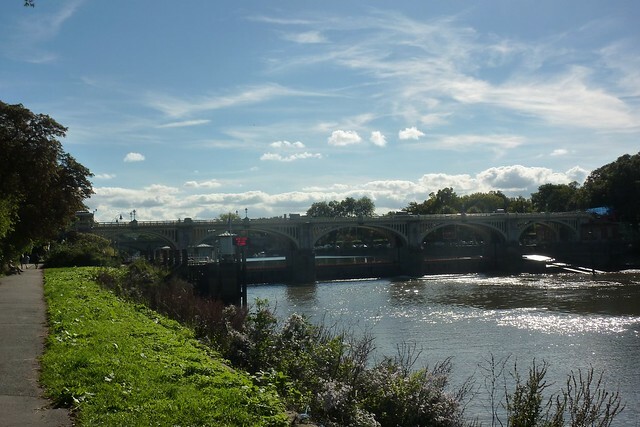 The benefits of having this licence – besides it being a legal requirement – can be found shortly upstream at Teddington Lock. In contrast to its neighbour at Richmond, there’s no illuminated dot matrix displays, no signs informing you that credit cards are accepted. Instead the locks are free to use: as long as you’ve paid £33.50 for your rowing boat. 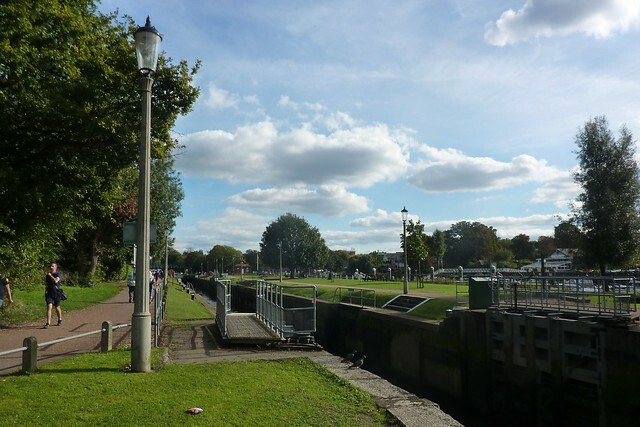 Teddington Lock instead looked like something out of the Victorian era. The lock-keeper’s building was sat on an island, having all the appearance of a rural village railway station; even with an old fashioned “TEDDINGTON” name board on the side of the house, and an impressive range of flowers in tubs and beds across the island. There was no sign of the lock-keeper – perhaps he was gardening somewhere – although there wasn’t much sign of any boats either, but the island in the lock was busy. The local branch of the RNLI was manning a stall to collect funds for lifeboats. Looking at the calm and tranquillity of the water, you wouldn’t think it would be necessary, but Teddington Lifeboat Station was opened in 2002 and gets several call outs a month. Most people on the island though were simply there to take in the good weather. Across the river was an equally busy establishment – a pub with a sizeable garden, complete with an extensive adventure playground for the children and a private mooring area in case you’d turned up with your own oars. “Fancy a go on the climbing frame?” I asked Sam, but all I got was the sound of snoring as he happily snoozed away in the sun. Instead we headed off towards the town heading past a variety of shops that showed how much money was in Teddington. Upmarket independent boutiques, pretentious gift shops and the kinds of pubs that you can only visit whilst wearing a rugger shirt with the collar turned up. 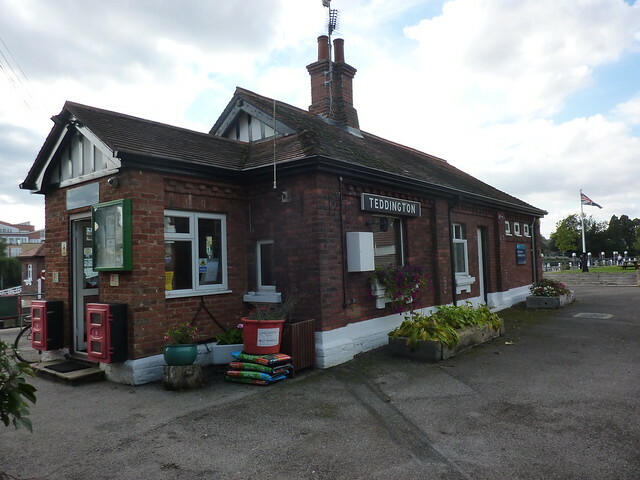 We pootled towards the station, wondering if there was a pub that might look more welcoming to a pair of slightly sun-burned and muddy walkers with a baby that wasn’t being transported in some three wheeled elephant size buggy, but there didn’t seem to be anywhere. “Ah, what about that place? The Teddington Cheese?” said Catherine pointing down the road as we strolled down Station Road. There it was. An old fashioned, pub style building, lovingly maintained and probably far enough away from the upmarket throngs to be potentially be a more down to earth boozer, albeit one that would be welcoming to small children who were sleeping in a baby carrier. “Knowing this place, it’s probably a cheese shop,” I noted, but we headed over anyway. It was a cheese shop. I’d like to say we popped in for some Smoked Gubbeen or Nettle Wrapped Cornish Yarg, and sat there munching it on the train. But we didn’t. Not least, because the shop was closed. Next time: some sort of boat things on the water, a royal palace, a royal town, a 500 year old tree, embarrassed of the river, and “Cameron did something or other”. First Published: 8 January 2014. Last Updated: 11 July 2016.